How do you make a well built home into an exceptional place to live, work and entertain? That was the challenge for Jerry and Karen Johnston, who had purchased an eight year old house in a great location, about two blocks from Atlantic Avenue in Delray Beach, across a quiet street from its own deepwater dock on an inland waterway. The house was solid, spacious, but poorly set up. So the Johnstons hired Think Simple together with nationally-known decorator Phoebe Howard, to bring the property up to its full potential. Howard, author of The Joy of Decorating and a monthly column in Southern Living Magazine, changed what had been an ugly yellow and orange color scheme to beautiful pastels. She refinished the floors, changed out the countertops, and helped the couple pick furniture, paint, rugs and artwork. Think Simple installed a superb sound system, bringing beautiful music into every area of the home. 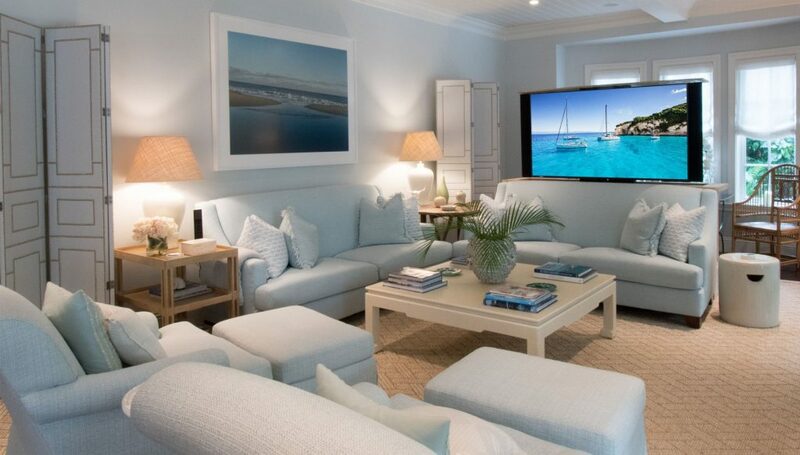 We also worked with Howard to place nine TVs, so that the Johnstons could enjoy a movie or a ballgame without giving up their view of the outdoors. The most remarkable room in the house is the family room. When you first walk in it seems quiet, comfortable, a great place to read or to talk. But push a button on the remote and a 65” TV rises up from a cabinet just behind the love seat. The sound system is exceptional. 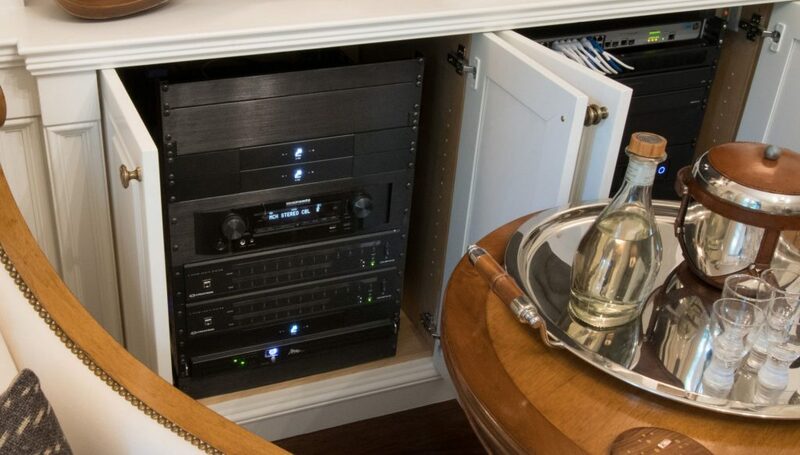 In the ceiling are eight Crestron Sonance speakers, four of them dedicated to music, while the others serve as the middle and rear speakers for Dolby surround sound. The Dolby system also includes two custom Leon speakers mounted on either side of the TV, plus a 1200-watt subwoofer hidden in the wall. The sub works with both the music and surround sound systems. Part of the impact comes from the components Think Simple chose, the rest from the tuning process we employ, the same we would use in setting up a concert venue or recording studio. Phoebe Howard had an important role as well. Before the remodeling, the TV had been positioned on the inside wall, so viewers would have their backs to the windows when they watched. 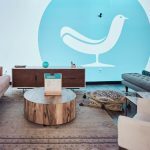 “Phoebe said that’s all wrong, and so in working with Think Simple she found a way to reorient the room so it could be a media room, family room and party room combined,” Jerry explains. The nerve center for the house is in Jerry’s office, which shares its back wall with the family room and its outside wall with the inputs from the electric utility and Comcast cable. 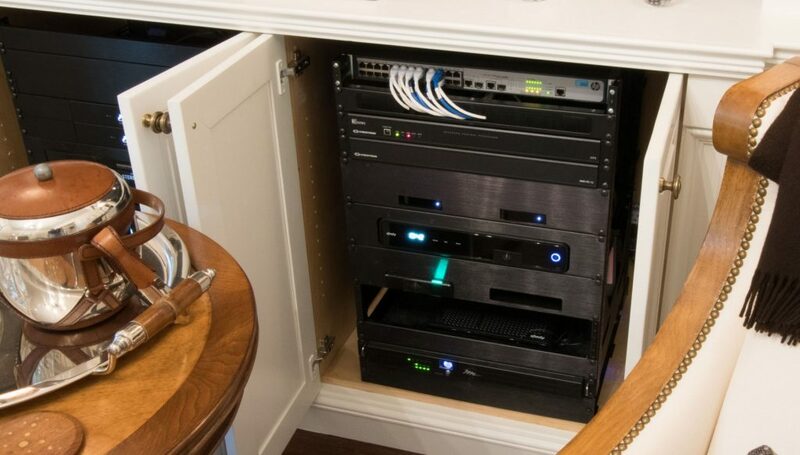 Into these racks we installed a 15-zone Crestron Sonnex® Multiroom Audio System, Crestron 3-Series® control system, and a Marantz surround sound receiver for the family room. We also installed a Wi-Fi network throughout the house, plus Crestron streaming media audio players, Apple TV devices, Comcast cable boxes and Nest thermostats in various rooms. 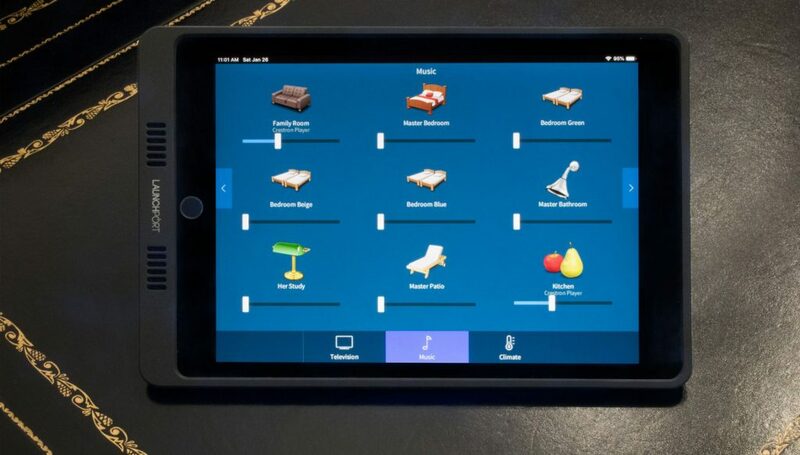 Jerry and Karen control all of these systems using their iPads, iPhones, or Crestron handheld remotes. As great as the family room is, the multi-room audio system makes listening to music a real pleasure in every area of the house, every day. Great sound is a priority to the Johnstons, and one of the reasons they hired us to do the work. 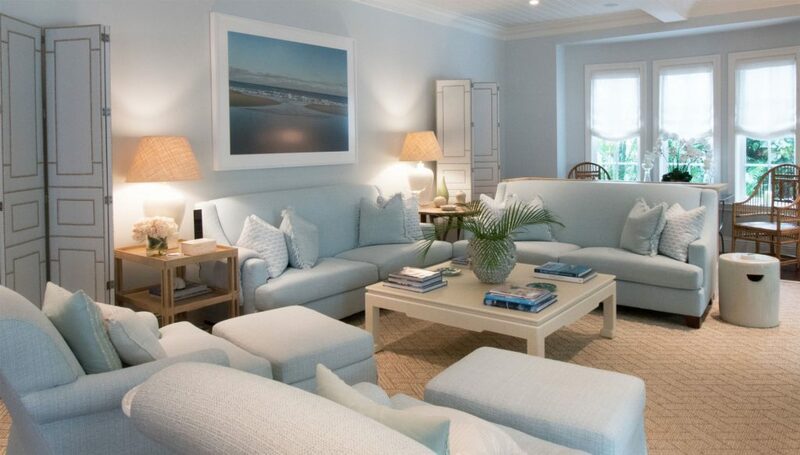 The finished house is stunning, so much so that Phoebe Howard featured it in her latest book, Coastal Blues: Mrs. Howard’s Guide to Decorating with the Colors of the Sea and Sky. It’s also been featured in a local decorating magazine, Haven. Learn more about the audio system here – and view more photos of the house.